Pasta with marinara sauce twirled around a fork. Pasta is the foundation of many nutritious and satisfying dishes. It goes great with vegetables, beans and fish, all of which provide fiber, protein and heart-healthy fatty acids. According to the National Pasta Association, pasta is also a low-glycemic food. Pasta is good source of folic acid, iron and several B-complex vitamins. 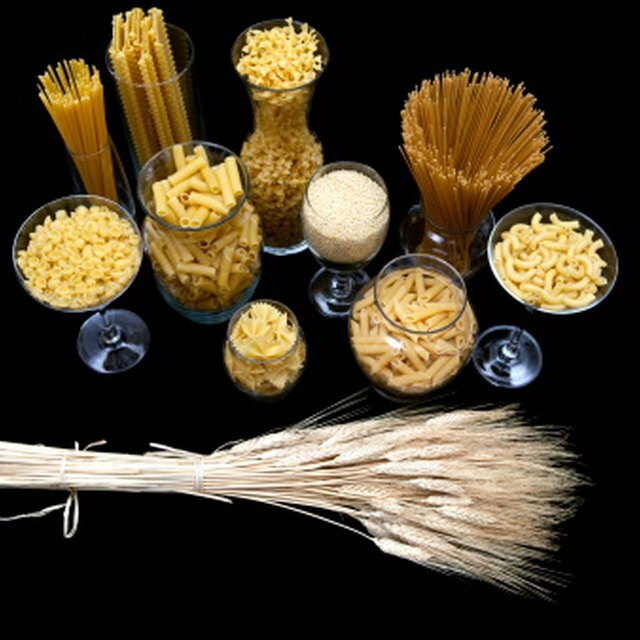 A cup serving of cooked wheat pasta provides up to 25 percent of your daily dietary fiber requirement. Pasta is also very low in sodium and contains no cholesterol. Pasta with marinara sauce is one of many ways you can prepare and enjoy pasta. According to Fat Secret, a one-cup serving of spaghetti with marina contains 185 calories and 5.95 grams of fat. You should probably not make it an everyday dish, because a serving also contains a high amount of sodium at 1,202 mg. The National Pasta Association recommends using small amounts of margarine, butter, vegetable oils and cooking spray in your pasta recipes. Experiment with fresh herbs and spices to add flavor. Find ways to trim fat without sacrificing texture and taste.